A good PDF should be more than just a scanned version of a book. Okay, so many of them are laced with hyperlinks and bookmarks, which are great. Some PDF releases really explore the potential behind pure digital media. When the second edition of Vampire: the Masquerade came out, I didn’t care about the Tremere at all. They were, to me, an excuse to make sure yet another RPG had a wizard hidden within it. I’ve grown to appreciate them over the years (mostly due to the evil machinations of my dear friend Ashley), but that’s another story. 1. You can’t please all the fans all the time, so why force them to buy a book full of compacts they’ll never use. 2. Lots of fans are, by nature, collectors and will go ahead and buy all the stuff anyway. Yes, those two factors seem to fly right in the face of each other; however, they appear to be the guiding light behind this endeavor. In today’s review, I’m not going into artwork or layout on the grounds that much of the artwork comes from earlier sources. For a pure PDF release (an experimental one at that), this makes perfect sense. We’re just going to jump right into the material and how the developers laid it out. There are two ways to pick up this product. You can buy it piecemeal for less than a dollar apiece. Each of these pieces cover nine or so pages. There is also the complete option, which comes in at $6.99 and 84 pages. I’m behind this tactic even though I’m nerdy enough to want the extra material (even though I may not read it). There are times though that a quick dollar spent to upload ten pages on, say, the Ashwood Abbey could make for some quick inspiration when prepping for a game. And these are good prepping materials too! 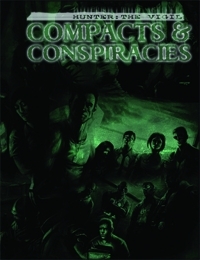 There is roughly a page devoted to an overview of the compact or conspiracy. From there, three sides (and secrets) are unveiled so that no group gets pigeonholed. After this setting-strong material is finished, some system-strong material steps forward. Endowments is the most common new addition to the groups; however,the sections also provide some “bonus material” that can include some interesting directions. I most enjoyed reading the section in Null Mysteriis regarding CSI on the supernatural and the Union’s section on mapmaking. Some might find the material in this PDF to be a bit redundant of the corebook, so I would suggest picking up a favorite compact/conspiracy first. After that, attack the others with abandon (sadly you would have to repurchase the single unit again with the complete set). The “repeated” text is, to me, delivered in a fresh enough approach that I found it worth a second look. This book does what iTunes offers. You sometimes don’t want a full CD – just the two or three good songs are enough, Mr. One-Shot-Wonder. Sometimes you don’t want a full book either, so you get what you have here. It’s a great idea. I’m leaving you without my usual scoring this review since I didn’t look at all the things I generally do. My overall for Compacts and Conspiracies is five out of five dice; it’s an ingenious direction to explore large gaming projects.